Canceled due to no sign ups. In Old Korvosa, nightmare-spawned horrors begin stalking the district’s shiver addicts, sparking a manhunt to bring those responsible to justice. 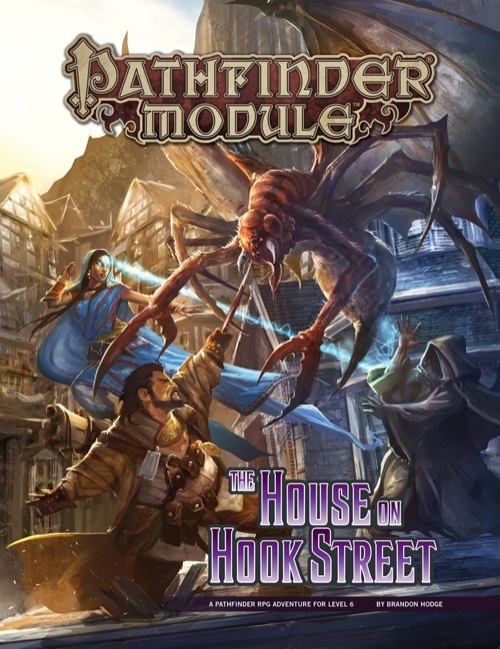 What role does the strange cult known as the Brotherhood of the Spider play in the mysterious deaths, and why is the veil between the dreaming and waking worlds so thin? To solve these mysteries and others, the heroes must walk the unseen paths of Bridgefront’s occult underworld, and even enter the Dimension of Dreams itself to unravel the web of intrigue concealing the cult’s deadly machinations. But what will happen when the heroes’ own dreams turn against them, and what becomes of those who uncover esoteric secrets too terrible to know? Beset by dangers from their own minds, the heroes must race against time to save Korvosa—and their sanity. Designed for use with Pathfinder Roleplaying Game Occult Adventures, this adventure is packed with terrifying thrills! 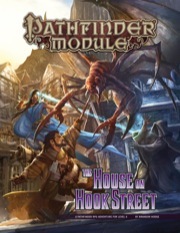 Written by fan-favorite author Brandon Hodge, The House on Hook Streetis a deluxe adventure for 6th-level characters, and includes 64 action-packed pages of engaging combat, urban investigation, and a new monstrous foe, plus a gorgeous double-sided poster map featuring an overview of Korvosa’s Bridgefront neighborhood and a miniatures-scale battlemap.